Clin J Pain. 2017 Dec;33(12):1047-1052. 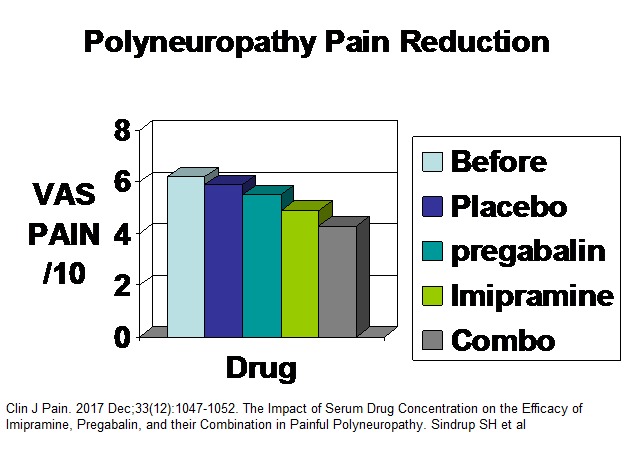 The Impact of Serum Drug Concentration on the Efficacy of Imipramine, Pregabalin, and their Combination in Painful Polyneuropathy. elderly >70 and poor metabolizers were given imipramine 25 mg once a day. Over 70 yr old, pregabalin 75 mg twice a day. Pregabalin only got a 0.4/10 pain reduction which was only weakly related to serum levels. Imipramine achieved a 1/10 pain reduction which was not related to serum level. The combo achieved a 1.6/10 pain reduction but was not considered enough to be synergistic. Both antidepressants and pregablin/gabapentin work primarily by stimulation the descending inhibitory circuits. Pregabalin effects were poor; some suggest 600 mg/day is needed for full effect, yet serum level had no effect on results. The combination had more meaningful results but of course more side effects. Comment – It has been suggested that opioids only drop pain levels by 1/10 over placebo so imipramine had similar effects. Would be more inclined to use venlafaxine though. I am not impressed with poor showing of pregabalin. This entry was posted in Drugs, neuropathic. Bookmark the permalink.